Matthew C. Horne is the worlds leading authority in Maximizing Human Potential. 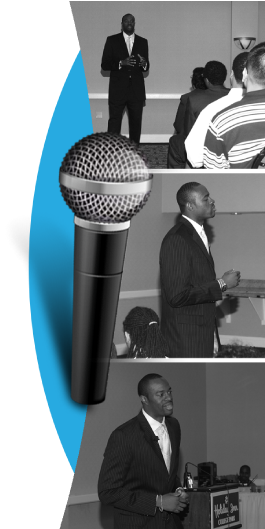 Matthew has delivered speeches to countless companies, organizations, churches, schools and many other entities. Matthew will show each audience member how to Maximize Their Human Potential, and make the impossible their norm. Book Matthew C. Horne NOW by calling him directly at 240-605-1106 or by emailing him at matt@matthewchorne.com. Many individuals having a burning desire to enhance the lives of people and create the change they wish to see in the world. Matthew C. Horne is hosting a live teleconference training series titled: �How To Become A Cutting Edge Speaker� From June 1, 2014 � Mid July 2014. Each enrollee will receive the training call-in phone number along with each training date/time in late May of 2014. After your payment is made, please email your phone number and email address to matt@matthewchorne.com, and your training information will be sent to you before the training starts. Below are some of the topics that will be covered in the: �How To Become a Cutting-Edge Speaker� Training. Make BIG MONEY Speaking For Free...and much more!!! "I took Matthew C. Horne's Speaker Training Course and it helped me a great deal. I was able to launch my speaker business and hit the ground running based off of what I learned from Matthew. His training helped me to place 3rd out of 3,000 Toastmasters at the District Speech Contest. This training is a must for anyone who aspires to speak professionally." WE PUBLISH AND PRINT BOOKS IN 3 WEEKS!!! Unedited Book in Microsoft Word, that includes the �About The Author Page,� �Preface Page,� Back Cover Content, Author Picture/Headshot. * Please email these materials to matt@matthewchorne.com after your purchase is complete, along with your phone number, a good time to contact you, and your primary email. Matthew C. Horne will contact you directly to begin the publishing process. Unedited Book in Microsoft Word, that includes the �About The Author Page,� �Preface Page,� Back Cover Content, Author Picture/Headshot, Links To All of Your Social Networking Pages. Unedited Book in Microsoft Word, along with what content you want on each page. We require a minimum of 24 pages to publish a children�s book.